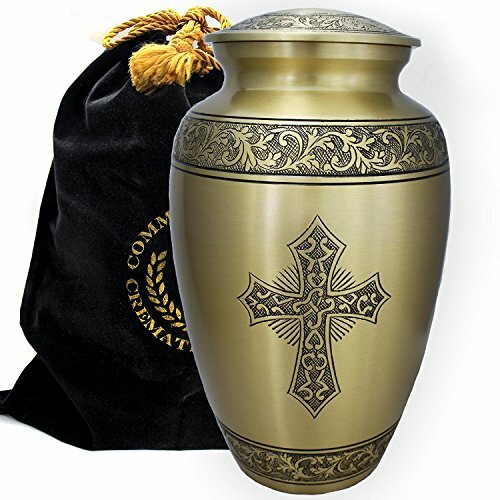 Love of Christ Gold Cross Brass Metal Funeral CREMATION URN FOR HUMAN ASHES - Adult/Large is a religiously bold tribute for your loved one, with a hand engraved cross centered in rays. Each CREMATION URN is handmade to perfection by an ancient process called sand casting. The Love of Christ Gold Cross CREMATION URN for HUMAN ASHES is made of solid brass and is constructed to last without tarnishing. This RELIGIOUS CREMATION URN is approximately 10 inches x 6 inches and has a volume capacity of 220 cubic inches (Note: 1lbs weight prior to cremation equals to 1 cubic inch after cremation). Comes with a Velvet gift Bag. We strive to provide you with the HIGHEST QUALITY lasting tributes for your loved one and WILL NOT TARNISH. This cremation urn is made of SUPERIOR 100% BRASS and more DURABLE than cheap quality aluminum. Always hand ENGRAVED to PERFECTION, ensuring each CREMATION URN is UNIQUE in design. This URN features a beautiful Catholic/Christian Cross. This FUNERAL URN comes with a velvet gift bag and is approximately 10 inches x 6 inches and is ideal as a tribute within the home, or also as a BURIAL URN. Comes with a Velvet gift Bag. Satisfaction GUARANTEED. If you are not happy with your CREMATION URN, we will accept it for a full refund. No Hassle. If you have any questions about this product by Commemorative Cremation Urns, contact us by completing and submitting the form below. If you are looking for a specif part number, please include it with your message.